I've always wanted to try my thumb (or hand actually) in gardening. I dream of having my own tiny herb garden where I'd be able to get fresh basils, cilantros and mints from. Finally, I had my chance. While checking out the Rockwell Urban Bazaar last weekend. The only thing that caught my eye was the booth that sells Egglings. Well..not quite. They are actually white porous ceramic containers that resembles that of an EGG. In here, my first plant will someday grow. I chatted with Jean (hope I got her name right),the girl who brought these tiny wonders into our shores straight from Japan. She told me how I can actually grow a wild herb or flowers out from the eggs. WOW! 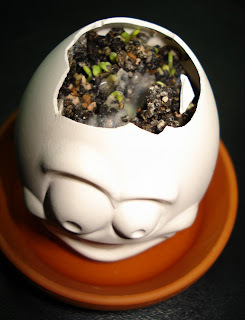 I looked closely at the samples and true enough I see egglings growing tiny strawberries, thyme and italian parsleys! She handed me her card and I noticed that there are different types of egglings available. At this point I am currently having a hard time choosing which one to get. Out of the corner of my eye, I saw egglings with funny faces. I was told that these are Crack-A-Heads very very much similar to Egglings but these little ones carry a different facial expression each. Finally, I chose the one with the surprised look. It's sooo cute and soon it'll grow into a basil plant. I can't wait!